(KIA*-POW*): Mission #301, 13 January 1945 in B-17G #42-107099 Ole 99 (427BS) GN-W. Hit by flak after bombs were released. Another flak hit set the #4 engine on fire and Ole 99 lagged behind the formation. Capt Martin S. McGinnis (P) and Sgt Lowell F. Stevenson (TG) were wounded. Capt McGinnis gave the bail-out order and he was assisted out of the stricken B-17 by Sgt Robert L. Lyons (E). The enlisted crewmen, led by Sgt Donald L. Beal (BTG), bailed out with 2Lt Frederick C. Doscher (CP) at the controls. The enlisted crewmen were joined after capture at the Dulag Luft Frankfurt, Germany interrogation Center and remained together as POWs until their POW camp was liberated. The Crew's original Navigator, Capt Marshall A. Neubert, and Bombardier, 1Lt Wallace A. Burket, were not on mission #301. Mission Navigator was 2Lt Richard M. Emick and Togglier S/Sgt S.R. Simone. Lt Emick was on his third mission - first mission with the McGinnis Crew.. S/Sgt Simone flew 11 missions with the Lt Philip D. Eisenwinter Crew. He became the crew's regular Togglier on mission #286, 12 December 1944, and was on his tenth mission with the McGinnis Crew. Capt Marshall A. Neubert (N) - Flew his first seven missions with the McGinnis Crew. Became a Lead Crew Navigator and completed his combat tour on 14 April 1945. 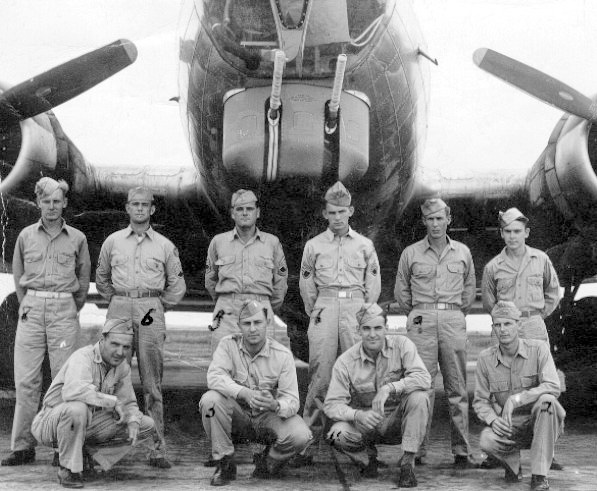 The McGinnis Crew flew with eight substitute Navigators on their last eleven missions. 1Lt Wallace A. Burket (B) - Flew four missions with the McGinnis Crew (#278,279,285 & 294) then with other Pilots. Became a Lead Crew Bombardier on 2 January 1945, flew seven missions as a Lead Crewman. Became a POW on 30 March 1945. Cpl Sillings (AE) - Removed from crew at Savannah, GA when crew size was changed from 10 to 9 men. Reassignment unknown.